You always hear people moaning about the cold winters in Edmonton but I’m of the mind that there is always something fun going on – even in the bitter cold – and if you’re bundled up then you should head out and take part in the winter activities! I love going to different holiday/festive events and activities with Mike and so I thought a compilation of some of the great (and really affordable/mostly free) winter activities coming up in the Edmonton area would make for a great blog post! I was also inspired by a Where Edmonton listing that’s being shared on social media – but everyone’s been sharing an old (last year)’s version! Details: Kick off the holiday season at the Christmas on the Sqaure Holiday Light Up! Enjoy an afternoon of free family activities, delicious treats from local food trucks, and live entertainment to celebrate the holidays in Downtown Edmonton. Join Santa and his helpers in a countdown at 6:30 pm to light up the massive Christmas tree and launch a spectacular fireworks display. Time: Activities start at 10 a.m. Photos from 11 a.m. to 4 p.m and 5 p.m. to 8 p.m. Details: Join us as we welcome Santa Claus to West Edmonton Mall’s North Pole Place, his home away from home during the holiday season. Enjoy a variety of entertainment, including a special improv performance of Disney’s Frozen, by Rapid Fire Theatre, while awaiting the jolly man in red’s arrival. The first 100 families to have their photo taken with Santa will receive a free holiday gift. Details: Join us for Edmonton’s biggest snowball fight! Connect with us on twitter @chase_jeff / @RobinMazumder, send us your digits at yegsnowfight@gmail.com for a text announcement, watch #yegsnowfight, and join us for THE snowball fight of all Edmonton snowball fights! Snowballs. Community. Edmonton. Winter. It doesn’t get any better than this! Details: Light up the holidays with a traditional Christmas celebration you won’t want to miss! Food vendors, Christmas treats, hot chocolate, Christmas music, storytelling, cookie decorating, Gingerbread Lane, Ice craving, visit Santa, and more! Details: All is Bright is a FREE festival celebrating the coming of the winter season. Taking advantage of the bridge closure, we’ll be playing all day in High Street, with activities for the kids during the day, and fun for the grownups at night! With light installations and ice scupltures, we will welcome the season with open arms and festive spirits! Cost: $10 (adult), $5 (youth aged 13-17 an seniors), $2 (children aged 2-12), free for infants under 2. Details: Check out over 100 decorated trees and seasonal displays. It’s a unique holiday shopping opportunity in the gift shop and sweets, treats, and entertaining shop. There’s a variety of children’s activites in Children’s Christmas Lane. Great local entertainment and more! All supporting the University Hospital Foundation. Time: Fridays 5-9 p.m., Saturdays 10-5 p.m., and Sundays 10-4 p.m. Details: The Royal Bison is an Edmonton-based, twice-a-year festival of the best and quirkiest art, craft and design this city has to offer. Two rooms of neat and sweet prints, books, apparel, toys, and more! While its roots are local, in 2014 it added a Canada-wide holiday edition to its roster. Time: 1:30 p.m. and 7:30 p.m. 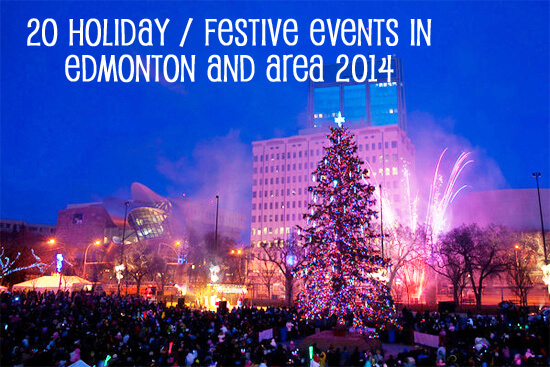 Details: Edmonton’s favourite holiday tradition continues to delight audiences young and old. Now in our 15th consecutive year of performance, our audiences are larger and more enthusiastic than ever. With an unforgettable story, rich characters, and dazzling special effects, A Christmas Carol is exceptional entertainment for the whole family. Once again, we will be taking donations after each performance to give to the Edmonton Food Bank. Time: Starts at 4 p.m. Details: December 4 signals the start of the holiday season at the Legislature. Light-up festivities will begin at 4 p.m. with a free choral performance by the University of Alberta Mixed Chorus. The evening will conclude with the ceremonial lighting of the grounds, which will boast over 300 sparkling trees. Time: Noon and 6 p.m. Details: Following the Light-up the seasonal fun will continue through to December 23 with daily choral performances at noon and 6 p.m. Enjoy the sights and sounds of the season set against the charming backdrop of our historic Alberta Legislature. Details: Light is inviting. Light is vibrant. Light is energizing. The Festival of Light will spread light and illuminate the spirit of Edmonton again December 2014. Join us this winter, as we stage a spectacular exhibition of artistic light installations within the unique setting of the Edmonton Valley Zoo. Winter crafts, scavenguner hints, skating rinks, photo booths and more! Details: Thousands of candles light the paths of the Kurimoto Japanese Garden in a breathtaking display – a quiet oasis of peace and light. In addition to a stroll through the candle-lit pathways, visitors can sip hot apple cider beside the bonfires, enjoy the seasonal sounds of strolling a capella singers and catch a glimpse of the magical “snow sprites” and glittering ice sculptures. A special Memory Lane will be available for visitors who would like to light a candle in memory of a loved one. Time: 6:30 p.m., 7:30 p.m., and 8:30 p.m. Cost: $16 (Adults), $14 (seniors & teens aged 13-19), $10 (children up to age 12), free for infants – free if you visit with no sleigh ride. Details: Edmonton’s Candy Cane Lane is visited by hundreds of thousands of visitors every Christmas season and it has become traditional for Edmontonians to flock to this West End Christmas Light and Decoration display every year. The sights and sounds of Candy Cane Lane instill the spirit of Christmas in all of us. The colourful light displays and unique decorations bring out the magic of the season for young and old alike. Christmas in Edmonton is not complete without a walk down Candy Cane Lane. Time: 5 to 9 p.m. or 2 to 6 p.m. Details: Feel the magic of a Christmas past. Step back in time and be part of a heritage Christmas. Gather your friends and family for some quality time in celebration of the season and unwind at the Park’s winter wonderland. Details: Head to Prairie Gardens for A Prairie Christmas – a cheery bonfire to warm you in the crisp country air with free marshmallows to roast, Christmas magic shows, Mrs. Claus Christmas sing-along, puppet shows, Christmas Bluegrass Folk Music, Make & Take a Christmas Craft, Festive lunches, free family photos with Santa, Polar Express Train Rides with Santa, and more! the Downhill Grill will go to the Christmas Bureau of Edmonton. Time: 7 p.m. and 2 p.m. Details: The Edmonton Singing Christmas Tree is a holiday tradition in Edmonton. More than just a tree full of carolers, the show itself has evolved over the years into an event the whole family will want to experience together, year after year! Time: Noon to 11 p.m. on Saturday (fireworks at 6 p.m.) and on Sunday noon to 6 p.m. Details: This winter adventure celebrates the Russian/Ukrainian “Olde New Year” and embraces the cold northern climate by melding artistic panache with authentic cultural and heritage winter games and fun. The Deep Freeze Winter Festival is a free family event that brings together the Ukrainian, Franco-Albertan, Franco-African, First Nations, and Acadian/East Coast communities to revel in the magic and beauty of winter. This year’s theme The RETURN of the Vikings! will offer exciting opportunities for both patrons and artists creating unexpected experiences celebrating the community through its urban landscape and exceptional spaces. Time: Monday to Friday from 2 p.m. to 10 p.m. & Weekends from 10 a.m. to 10 p.m. Details: During the Festival, visitors come to experience ten days of outdoor winter fun on the Giant Ice slide and the interactive Kids Zone and enjoy the International Ice Carving Competition, outdoor games, live music, cultural exhibits, food, fashion, hot beverages, skating and much more. Ice on Whyte has been rated by Readers’ Digest as one of the top 10 winter festivals in Canada and is also the winner of the 2012 Alberta Pride Alto Award from Travel Alberta. Details: As part of the Winter Cities Conference, there will be a number of pre & post-conference activities including bison tour at Elk Island National Park, skiiing and snowboarding, a starlight bike ride to the U of A Observatory, fun with snow sculpting and winterscaping, a Wacky Winter Challenge at Miquelon Lake, tour through the River Valley with Walkable Edmonton, and cross-country ski at Victoria Park Nordic Ski Loop! 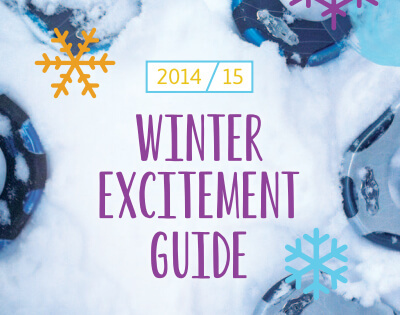 Check out the official Winter City Edmonton 2014/15 Winter Excitement Guide for more events and activities throughout the snowy season! There are also a few different festive events throughout December supporting the Christmas Bureau! Click here to check out those Christmas Bureau events including Dec. 3’s Christmas Cabaret, Face Off Against Hunger Christmas Luncheon, Christmas Bureau Breakfast, and Christmas Carol Sing-Along! Events start Dec. 3 and runs through Dec. 19! PrevPreviousChristmas in November Day 3 Recap + Recipes for Gougeres, Crackers and Chocolate Truffles!